Level II pupils doing their sketch of the taxi bay at Changi Airport Terminal 1. Sketching an icon of the Changi Airport. Level I & II Cubs at Terminal 3 Viewing Gallery. Words of wisdom from Mr Chan. Time to go. 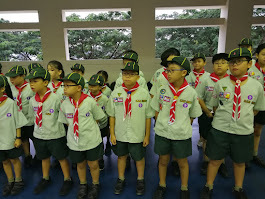 See how considerate and well-behaved our level II Cubs are!